The Boothbay Media Center is designed for your home theater to hold your DVDs, CDs and of course your Home Theater Equipment. The piece in the picture is made from Cherry. This media center can support your Plasma or LCD monitor on top or can be simply placed in front of your projection screen. There are two slide out base shelves to allow for easy access to the back of the equipment. Two adjustable upper shelves are provided for other equipment. The back is made from six raised panels. and contains four wire access ports and two cooling ports. An optional Power and data port (2 USB ports, an Ethernet Port and a Phone Port) distribution unit is available. There are also numerous hooks for securing the wiring to your external components and speakers. The cabinet can hold over 300 CDs or 120 to 130 DVDs or a combination of both. 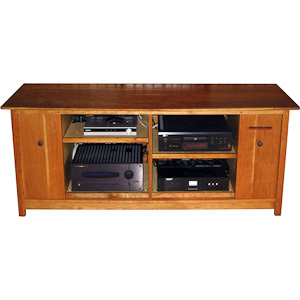 There are adjustable shelves to set up the shelves for your individual collection of media. There are wiring ports for power, audio and video cable so they pass between neighboring equipment bays. Note you may customize this design to meet your particular equipment dimensions.